AMSTERDAM, May 12th 2017 – For the past few years, I have increasingly had the feeling that sometimes I wasn’t always hearing what people were saying. Maybe there was an increase in mumbling, or maybe I was missing something in translation, given I live in a country where most people speak a different language from my own. Whatever the explanation, the problem was becoming more frequent. I acknowledged that I am indeed getting older, and needed to get my hearing tested. So I went to my family doctor/GP/huisarts, and found myself sitting across from a very young man, still a doctor in training. I explained the problem – in my best Dutch – offering also both of the explanations above. To my immense surprise he pulled a tuning fork out of his desk drawer, and stood behind me. He struck the tuning fork against his desk and held it a short distance from my head. He repeated this, holding the tuning fork in different positions, and asked me what, if anything, I could hear. After this short test of only a minute or two, he sat down and informed me that I had minor hearing loss on my left side, and advised me to go to a specialist hearing centre. A week or so later, I did just that, where I was asked to sit in a soundproof cubicle with headphones on, while another young man sat behind a computer in a different room but in my line of sight. He generated various sounds and I had to press a button if I could hear them, on the left or the right. This lasted much longer, maybe 10-15 minutes. At the end, he too informed me that I had minor hearing loss on my left side. Not yet serious enough to warrant a hearing aid, but something to check again in two years. I left with a booklet about hearing loss, a copy of the graph generated by the test, the advice to come back in two years, and permission to ask people to stop mumbling, in both English and Dutch. This experience was, for me at least, a wonderful example of the issues being explored in this project. 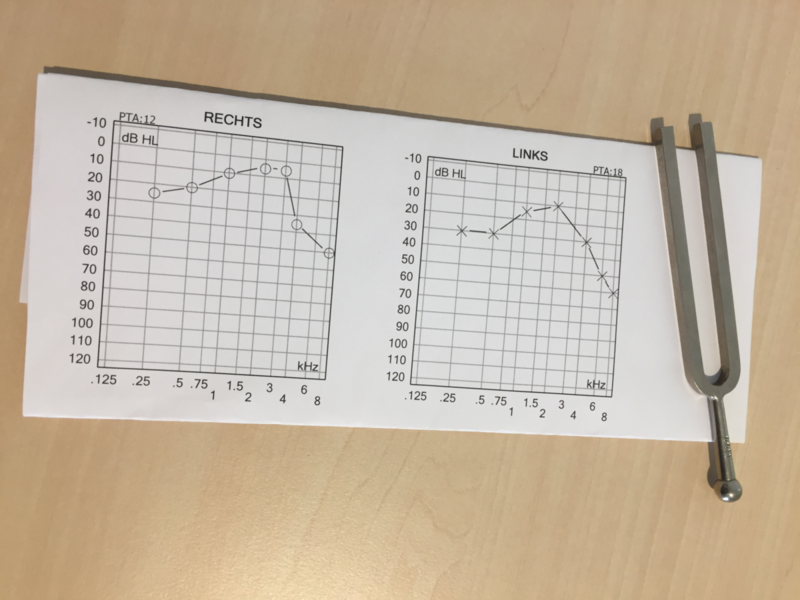 In 2016, in Amsterdam, a young doctor had somehow learned how to use a tuning fork to test a patient’s hearing. At the same time, not far away, another specialist was using a computer with sound and recording software, to generate a graph indicating which frequencies I could hear on both left and right. How are these very different skills being learned? How do you test if a young doctor is capable of using a tuning fork correctly? What happens to the data generated by the computer? Do all doctors have to learn both, or can they choose?